Prepare the vehicle for winter conditions. It is recommended to replace the car fluids, check the brakes, the windshield, the battery, and the tires. Pack first aid kit and winter safety kits. Drive slowly. Speeding on a snowy or icy road can be deadly. Driving slower than usual on this type of roads will allow drivers to stop the car if a sudden hazard occurs. Keep a proper distance from the front car. A minimum distance of three car lengths should be maintained between you and the vehicle in front of you. This distance should provide sufficient time to hit the brakes if the front car suddenly stops. Use a lower gear for traction. By using a lower gear, the vehicle will be less likely to accelerate when it slides on an icy road. Never use cruise control in winter conditions. Cruise control is designed to maintain a constant speed while traveling. On slippery roads, the use of cruise control can be hazardous. There’s a high possibility for a car to hit a slippery patch and loose traction and in the same time cruise control will kick in and accelerate in order to maintain speed. Keep the distance from the snowplows. Keep a distance of at least five car lengths between the car and a snow plow. Be alert, as snowplows turn and exit frequently. When trying to pass a snowplow, be cautious to not drive through the snow fog that it causes. Drive with your lights on. 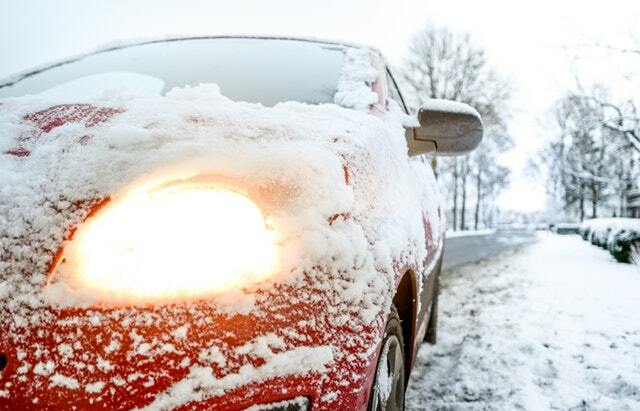 Even if outside is daytime, severe winter conditions can seriously reduce visibility.